Bishop Joseph P. McFadden D.D., V.G. Tom O’Malley was a true gentleman in every sense of the word. He was a staunch supporter of Irish causes both in USA and in Ireland. He was an stalwart as a board member of the Philadelphia St. Patrick’s Day Parade. Tom embodied everything good that the Mayo Association of Philadelphia represents. Tom represented the Philadelphia and Delaware Valley with class and dedication. He was a good Catholic and a good friend. Most important to him was his family who stood by his side every day, especially his brother in law Joe Boyle who drove him everywhere as he got sicker. However all this pales to his love for his wife Attracta, side by side companions through thick and thin for 50 years of marriage. Attracta, THANK YOU for sharing Tom with us all these years, we are all blessed to know both of you and will remember him, when we are in your presence ! Thoughts, hugs and prayers, you are blessed with very many happy memories and friends ! Matthew J. Veasey, Jr, 77 of Florida formerly of Philadelphia, Passed away on August 19, 2017. Beloved husband of Vicki Heltunen Veasey. Loving father of Matthew J. Veasey, III (Deborah) and Michael R. Veasey (Diana). Doting grandfather of Christine Veasey, Kelly Veasey, Melissa Howe Veasey, and Meghan Veasey. Great-grandfather of Elysia Bellina, Reznor Lloyd, MacKenzie Gavaghan, and Michael Gavaghan. Also survived by his sisters Rita (Bobbi) LoBiondo and Agnes (Pat) MacMahon. Predeceased by his first wife and the mother of his children Marie Gilmore Veasey. Matthew was a retired Philadelphia Police Captain. He enjoyed traveling to Ireland, golf, singing in the church choir, acting and directing in theater productions, his puppies Kipper and Katie, and spending time with his family. Relatives and friends are invited to Matthew's Life Celebration, Monday, August 28, 2017. 9:30-10:15AM at St Christopher's Church, 13301 Proctor Rd, Philadelphia, PA 19116. Followed by his Funeral Mass at 10:30AM. Surrounded by his family, on December 3, 2014. Age 95. Of Merchantville. Formerly of Pennsauken and Philadelphia. Loving husband of 55 years to the late Mary E. (nee Collis). Loving father of Kathleen A. DePetris (late Robert), Patrick J. Montgomery (Fran) and Joanne P. Montgomery (Mary Mills). Cherished grandfather of Patrick S. Montgomery (Marijo), Elisabeth F. Lamon (Sean), Meghan K. Montgomery, Erin S. Sullivan (Ron) and Brian J. Montgomery. Dear brother of James McManus (Patricia), late Steve Montgomery (late Mary), late John Montgomery (late Millie) and the late Betty Wilkins (late John). Loving great-grandfather of 9. Special uncle to Debbie Kleinow (Fred) and Pop-Pop to Rita, Bob (Jen) and Kate. Also survived by many nieces and nephews. Joseph attended Roman Catholic High School in Philadelphia. He proudly served our country in the U.S. Army Air Corps during World War II. He joined the US Army on May 1, 1940 serving in the Panama Canal Zone and Galapagos Islands attaining the rank of Staff Sgt. He served as a waist gunner on B-17 and B-24 aircraft on anti-submarine patrol and was a marksman with the M-1 rifle. Awards included a Good Conduct Medal, American Defense Service Medal, and American Theater Service Medal with 1 Bronze Star. He returned from Panama in December 1943 to teach gunnery at various Army posts in the US. He married Mary E. Collis on Feb 22, 1944 while home on leave. After the war, he got a job with the Quaker Grocery Co and spent the rest of his working career in the grocery business. He was a member of Teamsters Local 107 and later Local 500. He became involved in the Ancient Order of Hibernians, Division 65 soon after the war, becoming President in 1958 and serving in that role until 1998, the 100th anniversary of the Division. Since then, he has been the Division’s President Emeritus. He became a well-known figure, first in the Philadelphia Irish-American Community and then nationally. He served as President of the AOH Philadelphia County Board for four terms, President of the United Irish-American Societies of the Delaware Valley (honored as their 1983 Man of the Year), President of the Commodore John Barry USN Society, Secretary of the Irish Participation Committee of the 41st International Eucharistic Congress, co-chairman of the Irish Participation Committee of the “We the People 200”, President and Corresponding Secretary of the St. Patrick’s Day Observance Committee (of which he was a member for over six decades). He worked on the Advisory Committee of the “Treasure of Early Irish Art”, National Chairman of the Freedom for All Ireland Committee, and served as President of the AOH Pennsylvania State Board. In 1992 he was awarded the greatest AOH honor…Gold Card Life Membership. In 1993 he was elected the Grand Marshal of the Philadelphia St. Patrick’s Day Parade. In 1998 he was honored by Division 65 for his 40 year Presidency and the naming of the Division as the Joseph E. Montgomery Division…the first time an AOH Division was named for a living member. Among the Irish-American community he was known as a “true Irish gentleman” and a “Hibernian’s Hibernian”. 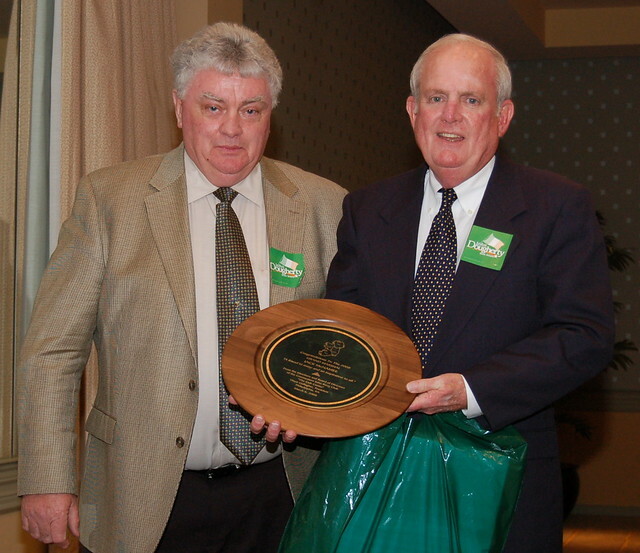 In 2009 he was again honored by being inducted into the Delaware Valley Irish Hall of Fame. After retiring from the grocery business, Joe became active in the Teamsters Retiree Association and served as their recording secretary for many years. He was a self-professed avid “health nut”, lifting weights and riding a stationary bike into his early 90’s. He was an active Church member, singing tenor for years in the Transfiguration Parish choir in West Philadelphia and, later in life, as an usher at the 4:30 PM Saturday Mass at St. Cecilia’s in Pennsauken. He was a member of the Knights of Columbus as well as the American Legion. He was also a member of the St. Cecilia’s senior group, the Half Century Jets. He and his wife Mary enjoyed taking trips with the Jets. Relatives, friends, AOH members and fellow Teamsters are invited to his viewing on Tuesday morning from 9 to 11:30 AM at Mary Queen of All Saints Parish: Saint Cecilia Church: 4824 Camden Ave., Pennsauken, NJ 08110. Mass of Christian Burial 12 Noon in the church. Interment with U.S. Military Honors in Holy Cross Cemetery, Yeadon, PA. In lieu of flowers, the family requests donations to: Mary Queen of All Saints Parish at address listed above or Catholic Partnership Schools: 808 Market St., Camden, NJ 08102 or Sisters of St. Joseph Villa 110 W. Wissahickon Ave., Flourtown, PA 19031. In the memo, please write: Joseph E. Montgomery. 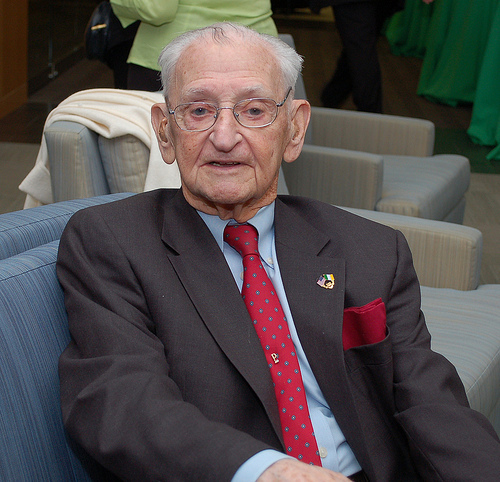 Edward A. Kelly, Jr. is a founding member and the first Secretary of the Saint Patrick’s Day Observance Association. He will receive the first” Founder’s Medal” in honor of his historic contributions to the organization. The Association has created this special medal in his honor and it will be presented 3/14/2014. Mr. Kelly was present at the initial meetings in 1951 where the idea of a parade was discussed. The group needed the approval of the Archbishop, who at that time was John O’Hara, later John Cardinal O’Hara. The reason for that was the previous church leadership would not sanction any Irish-type parade. And so, while there were some parades, they didn’t have the full support of the church and hence the Parishes. With Archbishop O’Hara’s support, through the urging of Mr. Kelly and others, the group prevailed and got the regional Parishes to march which allowed the parade to grow. Ed Kelly and the other founding members committed the SPDOA to a religious parade in honor of St. Patrick as opposed to just an Irish cultural parade. Ed always believed that the decision to join with the Archdiocese was the single-most significant decision of the SPDOA. It was the foundation of our future success and its continued growth since that session in 1951. Mr. Kelly has been a leader in the Catholic Church. For over 56 years he has been a member of the Holy Week group at the Malvern Retreat House. In politics, Edward Kelly, Jr. was a huge success story. His government career spans more than 30 years. After cutting his teeth in Irish politics with the likes of Sheriff Bill Lennox, Mayor Jim Tate, and Judge Vincent Carroll, he began to win elections in his town of Willingboro, N.J. His elections to the school board, city council and Mayor of that city prepared him well for the county level seat of Clerk of Courts of Burlington County. He was elected Clerk and served 5 terms of 5 years each ---25 years! Mr. Kelly’s life today has been distinguished by exceptional service in every arena he has moved. All he has accomplished has been done with distinction, honor and humility. We cannot forget, and indeed we must honor men like Edward Kelly. And so, with the Inaugural Founder’s Medal we do honor Edward A. Kelly, Jr., this “Man for All Seasons”, for the important contributions he has made to improve the lives of all whom he has touched. EDWARD T. GALLAGHER, January 2, 2014. Beloved husband of Emily (nee Daly). Loving and best Dad to Cecilia Lang (Brian) and Meghan Gallagher. Also survived by his grandchildren, Ronan, Kiernan, Kate and Nala-dog; and his favorite mother-in-law Kathleen Daly. Brother-in-law of Delia and Dolores Gallagher, Kathleen and Jack Kneafsey and Dennis and Mary Daly; predeceased by brothers James and Joseph and his sister-in-law Sr. Sally Daly, SSJ. Mr. Gallagher was a retired federal law enforcement officer and his special joy was being a Dad. Relatives, friends, AOH Div. 65, St. Patrick's Day Observance Assn. members and his "Pubcrawlers" are invited to his Funeral Mass Thurs. 10:30 A.M. at St. Cecilia Church, 535 Rhawn St., Phila., PA 19111 where friends may call after 9:30 A.M. Int. SS. Peter and Paul Cem. Friends may also call Wed. 7-9 P.M. at THE JOSEPH A. QUINN FUNERAL HOME, cor. Roosevelt Blvd. and Sanger St. In lieu of flowers, donations in Ed's memory to the Blessed Trinity Regional School Library, 3001 Levick St., Phila., PA 19149 or to the Pro-Life Union 88 Pennsylvania Ave., Oreland PA 19075 would be appreciated. Paul was the backbone and moral conscience of our Philadelphia St. Patrick’s Day Parade Board for over 50 years and was the Treasurer for 40 years. If you look up the word gentleman in the dictionary, you will see a photo of Paul. He was very proud of his Bishop Neumann High School Class of 1941 roots and the Grays Ferry section of South Philly. Paul was on more boards and knew more priests and nuns than anyone I have ever known. He was kind to everyone and always had good advice when you needed it. We are all better people for having known Paul ! Paul would have been a young 90yr old this August ! This comes as devastating news to our parade board as Knute Bonner another man with over 50 years on our board passed away just 11 days ago, and Paul’s longtime great friend on the Parade Board Jim Kilgallen’s 3 year anniversary is tomorrow! We will keep you posted on details. Please keep his son Chris and all his family in your prayers. PHILIP E. "KNUTE", on February 15, 2013, age 87, of S.W. Philadelphia. Retired Philadelphia Police officer. Veteran of the 159th Combat Engineers, Battle of the Bulge survivor, Jewish Concentration Camp liberator. Recipient of the Bronze star and the Purple Heart. Loving husband of 48 years to Patricia D. (nee Noone) Bonner. Father of Mary Beth (Thomas) Ryan, Philip, Jr., Sean K. (Patty), Sheamus (Whitney), Erin (Joseph) Hudyma, Bridget (Brian) Pot, Deirdre (Frank) Hines and the late Patrick Bonner. Also survived by 9 grandchildren, many nieces, nephews and cousins. Relatives and friends are invited to attend his Funeral Mass Friday 11:00 AM at Divine Mercy Parish, Good Shepherd Church, 67 and Chester Ave., Phila., PA. 19142, where friends may call from 9:30 AM to 10:30 AM Friday morning. Friends may also call Thursday Evening from 6:00 to 9:00 PM at the Good Shepherd Church. Interment SS. Peter and Paul Cemetery. In lieu of flowers family prefers contributions to Divine Mercy Parish, 6667 Chester Ave., Phila., Pa 19142. 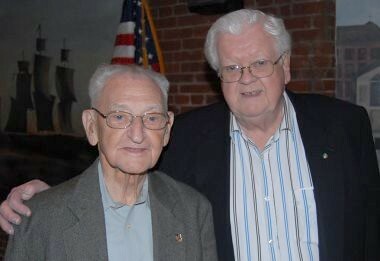 Jim Kilgallen passed away Saturday February 27, 2010.
and the unofficial “Mayor” of Havertown. He was a very important, influential and respected member of the St. Patrick’s Day Observance Association, and served as our President in 1999 and 2000. He was elected Grand Marshal of the Philadelphia St Patrick’s Day Parade in 2004. We will keep Peggy and his family in our prayers. What a great Irishman, even born on St. Patrick’s Day! Jim was born on March 17, 1931 and passed away on Feb. 27, 2010. He was married to Peggy and had 4 children. Jim was a proud St. Tommy More Graduate and coached football at Cardinal Dougherty and Semi Pro leagues. Jim was the founder and President of the Irish of Havertown who were one of the first groups to build a large float in the Philadelphia St. Patrick’s Day Parade. They are the most decorated group in the history of the Parade, winning the George Costello Award, the Organization with the Outstanding Float in the Parade a record 15 times! Jim was a longtime and proud member of the Mayo Association of Philadelphia, of course, with both of his parents being from County Mayo. He was a member of AOH 65 the Joseph E. Montgomery Division, the Friendly Sons of St. Patrick and also an active member of his church, St. Denis in Havertown PA. But Jim saved his best work for the Philadelphia St Patrick’s Day Parade Board serving in just about every capacity along with President in 1999 – 2000 and Grand Marshal in 2004. Jim started the Trip to Ireland ticket fundraiser, which was always the largest fundraiser for the parade. He was a proud bar owner, referred by close friend Jack McNamee (and fellow parade board member) as the “Saloon Tycoon”, running family owned Kilgallen’s Bar in North Philadelphia and eventually Havertown for over 50 years. The Philadelphia St. Patrick’s day Board honors Jimmy’s memory by the James P. "Jim" Kilgallen Award which is given to an “Outstanding organization that best exemplifies the preservation of Irish-American unity through charitable endeavors to assist those less fortunate at home and abroad”. Jim is sorely missed in the Philadelphia Irish Community for his hard work, dedication, strong will, sense of humor and laughter. Tommy Moffit has passed away May 2010! Tommy was classy, respected, shunned the limelight, was a great example for all of us to follow, kind, caring, had a great sense of humor, and loved by all. If you look up the word gentleman in the dictionary, they should remove the text and just put Tommy’s photo there. Tommy’s wife Peggy passed away in 1978, 32 years without her, yet never a complaint. Tommy’s heart was as big as the Irish Center. Today, there is a huge hole in the heart of the Irish community, but memories of our own hero, will help us all continue and keep the tradition alive. To Tommy’s family, thank you for sharing Tommy with all of us. You are each, one of our own, and there is no way we are going to let you go through this journey without us. You are just going to need to send out a lot more Christmas Cards! To Tommy, no more walker, no more wheelchair, no more arthritis in your fingers, no more nursing home, no more pain. Play that box and smile away, our loss is heavens gain! From now on, whenever we have a major event in the Irish Community, we will have a Box sitting on an empty chair in memory of Tommy. Tommy no one here wants to say goodbye, no one! So we will just say God Bless, and we’ll see you later. And I have one final message for Peggy and all our friends and relatives up in heaven. Sit back, relax, and enjoy the sweetest music this side of Roscommon, from your ETERNAL host, the legendary Mr. TOMMY MOFFIT! Rest in Peace Tommy, Rest in Peace! I received a phone call from Bishop McFadden and Cardinal Rigali expressing their sympathies and sorrow on the loss of Tommy not only to his family but the entire Irish Community at large. They apologized to me for not being here as well as many other prominent Irish priests of the Archdiocese, but today is the Ordination of new priests for the entire Archdiocese of Philadelphia and they are all required to be there, but their thoughts and prayers are with all of you. On behalf of Tommy’s family, I would like to thank you for the outpouring of cards calls emails flowers and food the last few days. It is nice to see people rally around a family in times like this and they really appreciate it. Also thank you to Father Doug McKay the Chaplain from The Holy Family Home and Little Sister of the Poor for celebrating Tommy’s life with the Mass today and also to Monsignor Jim Howard, Fr. William Allegretto CM & Fr. Carl Pieber CM for concelebrating. Tom had 3 wonderful Children that he was very proud of: Cathy who works at the Holy Family Home, Mary who works at the Miraculous Medal Shrine, & Tom the Air Force Master Sergeant and he would do anything in the world for all of them. He was always telling us how nice they were, shocking isn’t it, that Tommy Moffit would have great children? Gee the apple didn’t fall far from that tree did it? Also let’s not forget his longtime great friend and companion, Joan; it’s a tremendous loss to Joan as well. Tommy had a daughter in law Nancy and a son in law Ronnie and he told me that they were not in laws, they were his family and he was very proud of them and loved them like his own. They would do anything for Tommy and vice versa. Coleen- a former Eagles cheerleader. Tommy was probably the only guy in the Eagles stadium who was looking at the cheerleaders with binoculars, who was telling the truth saying that he actually was looking at his granddaughter. Sean S. - the Philadelphia police officer – Tommy got stopped one time and threw Sean’s name around and didn’t get a ticket and he was delighted with himself, and always was telling that story. Sean T- who was recently married to Jenna and much to Tommy’s delight, just found out they are having a baby girl. Sean loved listening to Tommy’s stories. (I’ll let you in on the worst kept secret Sean, we all did) Sean is unable to be here today because he is in the Air Force and currently deployed in Afghanistan so not only will we pray for Tommy today, we will also offer this Mass for Sean and all our servicemen and women throughout the world, and that God brings them all back safely. Caitie the gymnast - he worried more about her knee than his own. Timmy - the only one who had any interest in musical instruments. Tim, I’ll give you a hint, take up the accordion, look at how many friends you will have! And Daniel – the baby, who is too new for a history with Tommy, but Tommy already decided he was going to call him Danny not Daniel, so I guess the name Danny will stick. Tom also was very happy when his nephew Pat Married Beth. He loved them both and said she was just what Pat needed and the best thing to happen to him. There is no way you can jam 80 years of memories into 3 minutes, so I can only hit on his highlights. If you have a story to tell about Tommy, please come back to The Irish Center and relate the stories to his friends and family so Tommy can be given a proper Irish sendoff. And I am purposely leaving out names of his friends for fear of forgetting one and hurting anyone’s feelings. His family, faith and his love of "traditional" Irish music consumed his life. Tommy came here with his sister from Castlerea Roscommon at the age of 16 after the death of his parents within 3 months of each other. Listen to that statement again and realize how powerful it is. He lost both of his parents within 3 months of each other, moved to another country, all at the age of 16? Can you imagine how traumatizing that must have been? Did you ever see teenagers today when they lose cable for an hour? Did anyone ever hear Tommy complain about that or whine on how tough he had it? I never knew that about him until I talked with Mary. I already thought he was one of the greatest human beings I had ever met, digging into his past, he truly was a Saint on Earth and we were all blessed to be in his presence. Tommy was a proud Veteran of the Korean War. Tommy loved the Eagles, Phillies, and Notre Dame, but his true love and legacy was Irish Traditional Music and the button accordion or box which he learned to play by ear. This talent was his entrée into the Irish Community in Philadelphia and boy what a legacy he leaves behind. He played the "BOX" for many years bringing much pleasure to many people who loved to dance and with his big smile and even bigger heart enriched a "family of friends" who enjoyed his music all over our area. He was a member of the Philadelphia Musicians Union. He played for years every weekend at the Fireside room at the Irish Center, O’Malley’s which is now McGullicuddy’s, the Erin Pub, Timoney Ceilis, The Irishman's Inn, Devine's, Wren Parties, Emmett’s Place, numerous weddings, and the list goes on and on. He played for the Philadelphia Ceili Group, in Atlantic City, and played the first year they started Irish Weekend in North Wildwood. Tommy was one who tirelessly promoted Irish culture and pride throughout the Delaware Valley in so many different venues and was a great supporter for so many different Irish organizations all over. Tommy was a proud member of the AOH Joseph E. Montgomery Division 65, and received the 1st ever Joseph E. Montgomery Award. Tommy was the first member of the Delaware Valley Irish Hall of Fame. Today, they typically honor 4 or 5 people, so they can fill the ballroom at the Irish Center. In its initial year in 2001, Tommy the only honoree, filled the room with over 600 people and they had to turn people away at the door. Hall of Fame in 2002. He was Grand Marshal of the Philadelphia St. Patrick's Day Parade 2006 and our TV color man for many years. His radio show, along with his ceilis endeared him to everyone. His work at the Little Sisters of the Poor alone earned him a front row seat in heaven. He graced just about every major Irish event with his band, being the MC, his presence or promoting it on his radio show. He stressed to us how important it is to keep the tradition alive and helping do fundraisers for Vince and Marianne & the radio shows. I think we all learned a lot from Tommy Moffit and he can NEVER be replaced. We can only keep him forever in our minds and hearts and try to emulate him. And there is one final lesson we can learn from him. You never saw eyes light up in a man like when you visited him at the Home. Hundreds of people show up for a funeral when someone passes away. Why don’t all of us go visit someone we know who is lonely in the next week or 2, while they are alive, in memory of Tommy? That would make him very, very happy. Tommy’s wife Peggy passed away in 1978, 32 years without her, yet never a complaint. Tommy’s heart was as big as this church. Today, there is a huge hole in the heart of the Irish community, but memories of our own hero, will help us all continue and keep the tradition alive. Tommy, no more walker, no more wheelchair, no more arthritis in your fingers, no more nursing home, no more pain. Play that box and smile away, our loss is heavens gain! From now on, whenever we have a major event in the Irish Community, I will have a Box sitting on an empty chair in memory of Tommy. Tommy no one here wants to say goodbye, no one. So we will just say God Bless, and we’ll see you later. And I have one final message for Peggy and all our friends and relatives up in heaven. Sit back, relax, and enjoy the sweetest music this side of Roscommon, from your ETERNAL host, the legendary, Mr. TOMMY MOFFIT! Loretta and Sean, I want to thank you for the opportunity say a few words about Jack, with all the outpouring of friends that have shown up for him, to be selected to speak about Jack is truly an honor. When someone passes away there are 2 phone calls that are made immediately. If you live in Springfield, the first call is to Billy O’Leary. The 2nd is to our Priests where we start the healing process. We start out our lives here in a church in Baptism and we end it here as well. There is something comforting about the rituals of the Catholic Church and there is a reason that those rituals have survived over 2,000 years. 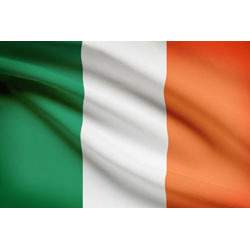 We hear the same songs over and over, “How Great thou Art, On Eagles Wings, and if you are Irish, Lady of Knock” and we never tire of hearing them. When you think Jack, he was really rather simple. His life was defined by 4 very strong characteristics and they were all intertwined together. Faith, Family, Friends, and Heritage. #1. Faith - Jack had a strong Catholic Faith. If you ever visited Williamson’s on City Line Ave where Jack was the Manager for 27 years and for the past 15 years at CJ McGee’s you would notice the Priests and Nuns were always there. Jack loved the Clergy. And I’m sure Mary McGuinn can attest to that as we spoke the other day about it. But in a way only Jack could when you would say “ Jack , Sister or Father so and so is in the dining room, can we buy them dinner, he would say, well hmmmm I'll take that mine blah blah blah you know give me that. There never was a real sentence there. The same nuns who would have clobbered him in school because you can’t diagram a sentence without a subject, verb and object in it, loved him. And he was so good to all of them, and so proud of his Catholic faith, it made him happy to do it. Jack never referred to where he came from in Philadelphia as Olney; he would say “I went to Cardinal Dougherty”. When he moved to Springfield, he would say I’m from St. Francis Parish. He was fiercely proud of our Catholic Identity. #2. Family- Jack and was a great father to Sean. Loretta said he married a Polock, none of the Irish would have him, and they were married for 38 years. They all worked in the business at CJ McGee’s, and we know how stressful that can be living and working with family 24-7, but it worked out. The 3 of them made CJ McGee’s a happy place where all were welcome, especially children. The stress the last few months as the hospital trips became daily, wears on family but especially on Loretta and Sean. Thank you for all you did for Jack as an excellent caregiver and nonstop companion. Their family is one of the cornerstones in Springfield. I know they will miss Jack terribly, but what a great tribute they have shown to Jack with the Viewing and Mass, you know he is smiling down upon you, and very happy and free from pain. Jack always told us about his “Sisters”, and Mary Jo and Margie have also suffered a great loss and have our sympathies as well. We talk about Jesus and how he suffered and died for us. There is no greater love than to lay down one’s life for another. Margie embodied that critical part of our religion not once, but twice. Margie gave her own kidney to Jack when he needed one 15 years ago, and then again a little over a year ago, give her own bone marrow to Jack for a transplant. For those of you who don’t know, the donor suffers much worse than the recipient, and can suffer pain up to a year after the transplant. We are blessed to have Margie with us in this church today, just as Jack was blessed to have her. Margie you are a living testament to the teachings of our Lord and thank you for all you did for Jack. You are amazing! I also would say there is no other restaurant that a picture of the owner’s parents hung over the fireplace as the centerpiece of the dining room. Yes, family was essential to Jack. #3. Friends - He was fiercely loyal to his Friends. Once again intertwined with Faith and Family, friends often became like family to Jack. 2 of his former employees are up here on the Altar and many of you in the congregation also worked for Jack. There is no way I could ever name all of his friends, for fear of leaving out one, you know that you all held a special place in his heart or you wouldn’t be here today. Thank you for being part of his life and making him smile. Wallsy, Burnsy, Joe Martin, Ed Gallagher, Jim Kilgallen, Paul Phillips, Michelle. You all have your own stories to be shared over and over, he really was a character! Especially when you disagreed with him. You didn’t know Jack well if you didn’t get that “you are kidding me” Donegal deadly stare when you happened to disagree with him. Yes, he could be ornery, argumentative, and loud, but that also made him an excellent businessman in a tough business. Jack knew the bar and restaurant business inside and out, and had a steely resolve. There is a book of quotations by Bartlett and there is one that says "It’s my way or the highway”. Now I don’t want to say Jack penned that quote but they have his picture under it in the book! # 4 Heritage - At CJ McGee’s Jack’s 2 favorite days were not St Patrick’s Day, which he hated when people referred to it as Paddy’s Day. He said we are Catholic and its St Patrick’s Day. It was the 2 days of the Philadelphia and Springfield St Patrick’s Day Parade’s. Jack loved to have the music all day after Springfield’s Parade; it was always the same year in and year out. Even when Bob Finnegan moved to Florida, Jack still made him drive up every year and play with Tina. And God forbid Franny O’Hanlon’s Lafayette Team made the NCAA Basketball Tournament, Jack wanted him there to play the banjo or else! He loved to have all the kids there, he had to, my family alone is about 70, to see our faith, families, friends & heritage all blend together with young and old, music and song, food and drink. Jack intertwined his faith, family friends and Heritage by one of his greatest loves, Notre Dame Football often watching the game at McGee’s with family and friends. The day he married Loretta, Tommy Moffit’s Band was playing at the reception. Tommy asked Jack if he had any requests and Jack said he wanted the update on Notre Dame’s football game to be called out every 20 minutes. Tommy said he meant songs, and Jack said I told you what my request is. He loved to go to South Bend and out to see them play USC. He used to battle with me because I went to Penn State, and I would have to hear every year how after they won their first game, they were going to go 12 – 0, win the National Championship, and their quarterback was always going to win the Heisman. Jack’s idea of compromise was when I would bring a load of Penn State fans in to CJ McGee’s, and IF Notre Dame wasn’t playing, and IF there were no other games on, he would allow Penn Sate to be on one TV to appease us. That made the rivalry all the better and we all will miss that. Jack helped so many people and never once would accept credit. Whenever someone was in need, he was always there, but always in the background. He would always say paper them up when we needed something, that meant peel off the bills. He loved to fish and to go to Sea Isle and once again it was family and friends, and Irish Stories. He was a member of the Donegal Association of Philadelphia. He was a huge part of AOH Division 65 and Joe Montgomery was his mentor. He served for many years as the treasurer and when there was no money to continue, Jack’s generosity somehow kept it afloat. He was past President and longtime board member of Philadelphia St. Patrick’s Day Parade and kept that solvent with his generosity as well. Virtually every meeting was held at McGee’s, with bills always seeming to disappear. He headed the Golf Outing and was the chief sponsor, and headed our most stressful and most profitable fundraiser, selling the parade badges. He had his hand in everything. He always had his pen out scribbling on one of those index cards, writing who owed what. The honors poured in recently “Grand Marshal Springfield St Patrick’s Day Parade 2007, Grand Marshal Philadelphia St Patrick’s Day Parade 2008, AOH Division 65 Man of the Year 2009. It’s nice that he was alive to enjoy them. The Lord knows this was hard on his family, but he would have never accepted being in hospital, or walking with a cane or a walker, and sometimes we don’t understand why God does something like this, but it is God’s plan not ours, and He know best! Even though he is not with us now, he is no longer in pain, and his will and spirit lives on in Loretta and Sean. He may be gone, but he will never be forgotten. I know that God will bless him and give his family strength. 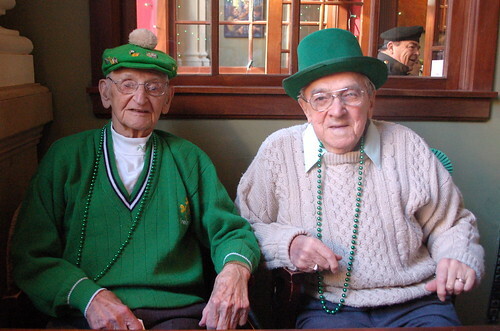 Copyright © 2013 The St. Patrick's Day Observance Association. All rights reserved.